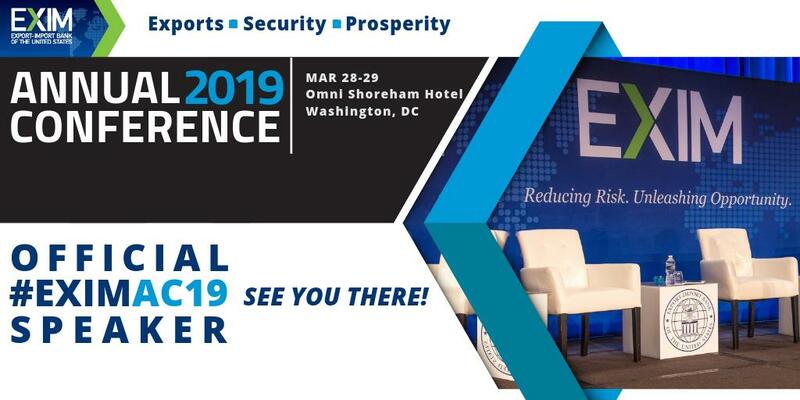 The 2019 annual conference of the Export-Import Bank of the United States (EXIM) bringing together leading figures of government, business and academia will be held on March 28-29 at the Omni Shoreham Hotel in Washington, D.C.
EXIM’s acting president and chairman of the board of directors, Jeffrey Gerrish, is expecting to welcome around 800 participants to the event. A keynote address on the present U.S. trade and economic policies will be delivered by Peter Navarro, the director of the White House Office of Trade and Manufacturing Policy. Top business and academic leaders, including John G. Rice, chairman of GE Gas Power; Robert Gwin, president of Anadarko Petroleum Corp.; Eric Fanning, president and chief executive officer of the Aerospace Industries Association; and Douglas Holtz-Eakin, president of the American Action Forum, will take part in several discussions and plenary panels at the conference. On day one, there will be a session on “The Intersection of National Security and Export Credit” and another session follows on the second day titled “EXIM and the Importance of the U.S. Energy and Manufacturing Sectors”. Join the conversation at #EXIMac19! Learn about government resources available to help increase your international sales, fund overseas expansion, engage in emerging economies, & mitigate risk. Let us help you successfully launch/expand your global market strategy. Register now. “The two-day event offers breakout sessions with EXIM export finance specialists on how to use EXIM’s products to begin or to expand exporting and includes opportunities to network with experienced EXIM lenders, brokers, foreign buyers, among others,” according to the press release. EXIM is an independent federal agency that provides “competitive and necessary export credit to overseas purchasers of U.S. exports to promote and support American jobs.” It also supports thousands of small and medium-sized enterprises (SMEs) across the country. The Omni Shoreham Hotel is offering overnight accommodations at a conference rate of $310.00/night +14.95 percent tax (single occupancy). For more information, contact Matt Burdetsky, Capital Meeting Planning, Inc. at matt@cmpinc.net or on the phone at 703-536-4993. Register here to attend the conference.